Before buying a generator there are a number of things to consider. Using this tutorial, you can get the basics down and determine your power needs to be sure your generator best suits your needs. Our three generator packages combine our portable generators, a manual transfer switch, and ABC's quality service packages so you can conveniently purchase everything you need all for one price. Available on our portable generators to your nearest freight station. Only applicable in the lower 48 United States. Be sure to review our shipping policy. OUT OF STOCK, PLEASE CALL 716-510-0310 BEFORE ORDERING THIS ITEM! Baldor portable generators are equipped with industrial grade engines to provide the performance and dependability you can count on. Baldor manufactures it's own generators and backs them with an industry leading 3- year limited warranty. 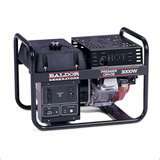 Baldor portable generators also feature "Switchless Full Pow'R", eliminating the need for a "Full Power" switch. Automatically get the 120V or 240V nameplate power rating without having to flip a switch. Baldor Premier portable generators incorporate the features you've come to expect from the leader in portable power generation. Switchless Full Power -- Automatic 120V/240V operation. Automatic Idler System -- Reduces fuel consumption, extends engine life. Focal Vibration System" -- Reduces vibration, extends generator life. Prices are subject to change without notice. Please call to ensure you have the current pricing.